1.Would you rather go out with messy hair and nice make-up or Nice hair and no make-up? Nice Hair and no makeup! I usually do this on the weekends or when I'm just going out to grab something. Natural Beauty always looks good. 2.Would you rather shave your eyebrows or have your eyelashes fall out?My eyelashes fall out, there's always false eyelashes. But there's no fix to shaving your eyebrows except for filling them in which don't look as good as waxed eyebrows. 3.Would you rather be forced to shop at only MAC or Sephora for the rest of your life? 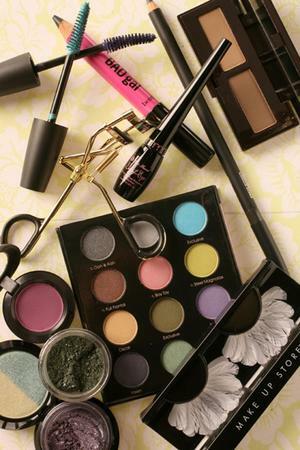 Sephora all the way, I love MAC but I mainly shop there only where there are collections that I'm really into. I mainly go to Sephora a lot. Much more brands! 4.Would you rather wear lipgloss/lipliner look or 80's perm? Lipgloss/Lipliner look. I don't think an 80's perm would look good on me. 5.Would you rather leave the house with an obvious foundation line or overdone blush? Overdone blush, during the day it ends up fading. An obvious foundation line is there the whole day. 6.Would you rather wear MC Hammer pants or biker shorts in public? Biker shorts. MC Hammer pants not so much. 7.Would you rather have a bad orange-y spray tan or really weird tan lines that can't be covered? Werid tan lines, an orange-y spray tan takes a long time to fade. 8.Would you rather have a bad haircut or bad hair color? Bad hair color! You can always style your hair and make it look good. A bad haircut would take forever to grow out the hair. 9.Would you rather have youtube or twitter taken away forever? Hmm..this is a tough one. I would have to say my twitter. I use it a lot but not as much as youtube. And I can go days without tweeting but can't last without checking my subs on youtube. 10. Would you rather give up using makeup brushes or mascara? Mascara. I don't really use it much. But makeup brushes create and perfect my look!